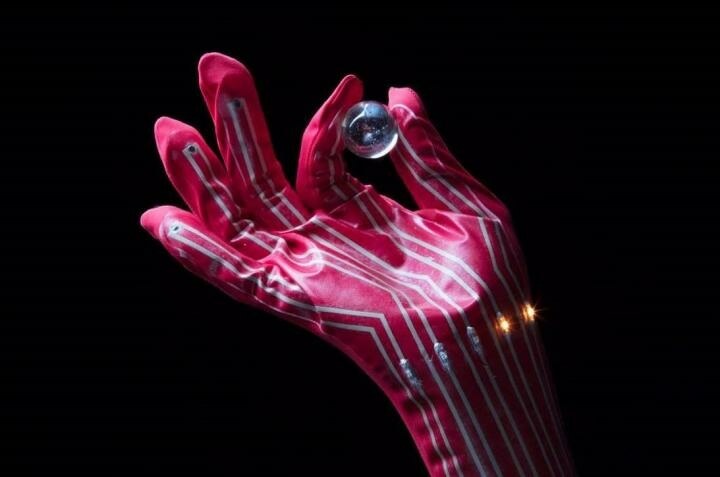 Each fingertip pressure sensor mounted on this glove is connected to an LED. The intensity of the LEDs varies according to the pressure applied by the fingertips. The glove makes it possible to ascertain degrees of pressure that are difficult to obtain just by examining images. (Credit: 2017 Someya Group, The University of Tokyo). Japanese scientists have developed a new printable elastic conductor that retains high conductivity even when stretched to five times its original length. The novel material is manufactured in paste-like ink form, which means it can be printed in different patterns on rubber surfaces and textiles as stretchable wiring to impart human skin-like functions to robotic arms/exteriors and for wearable devices integrated with sensors. Wearable devices such as those used for monitoring a person's physical performance or health like heart rate and muscle activity are presently being developed, with some products already launched on the market. In addition, with the infiltration of robots in retail, health care, and manufacturing areas, potential applications for sensitive elastic conductive material that can endure the high strain caused by stretching are projected to increase at a rapid pace. We saw the growing demand for wearable devices and robots. We felt it was very important to create printable elastic conductors to help meet the need and realize the development of the products. In order to obtain excellent conductivity and stretchability, the scientists combined four components to develop an elastic conductor. They observed that their conductive paste considerably outperformed the elastic conductor which they had earlier developed in 2015. This new conductive paste included fluorine rubber; micrometer-sized silver (Ag) flakes; fluorine surfactant, a well-known substance that brings down surface tension in liquid; and an organic solvent to disperse the fluorine rubber. Without stretching, the printed traces of the novel conductor were able to record as much as 4,972 siemens per centimeter (S/cm), high conductivity using the standard measure for evaluating electrical conductance. When the new conductor was stretched by 200%, or to thrice its original length, conductivity measured 1,070 S/cm, which is almost six times the value of the earlier conductor (192 S/cm). Even when the new conductor was stretched to five times its original length, or by 400%, it was able to retain a high conductivity of 935 S/cm, the highest level to be ever recorded for this level of stretching. Magnification by a transmission electron microscope (TEM) and scanning electron microscope (SEM) revealed that the self-formation of Ag nanoparticles present in the conductive paste was responsible for the high performance of the conductor, after printing and heating the new conductive composite paste. Ag nanoparticles measure one-thousandth the size of the Ag flakes and are evenly dispersed between the flakes in the fluorine rubber. "We did not expect the formation of Ag nanoparticles," comments Someya on their surprising discovery. The researchers also observed that when variables like the molecular weight (MW) of the fluorine rubber are adjusted, the population and distribution of nanoparticles can be controlled, while heating and the presence of surfactant expedited their formation and affected their size. In order to prove the feasibility of their conductors, the researchers developed fully printed stretchable temperature and pressure sensors, which are capable of sensing weak force and measuring heat close to room and body temperatures. These sensors were wired with the printable elastic conductors integrated on textiles. They can be easily installed by laminating them on surfaces by hot pressing with pressure and heat. The sensors took exact measurements even when stretched by as much as 250%. This is sufficient to accommodate high-stress flexible areas such as joints on robotic arms that are usually designed to exceed human capabilities and hence experience higher strain, or knees and elbows on conformable and form-fitting sportswear. The novel material can last for a long time and is ideal for high-capacity printing techniques like screen or stencil printing that can cover huge surface areas. It allows for easy installation, and its properties of forming Ag nanoparticles (which cost significantly less than Ag flakes) when printed provide a low-cost option for realizing many different applications for deformable electronic devices, wearables, and robotics. The scientists are now looking for alternatives for Ag flakes to further bring down the costs, and are also looking at nonfluorine rubbers and other polymers, as well as different combinations of processes and materials to develop elastic conductors that deliver a similar high performance.